Well, one idea anyway. Why not treat your loved one to some Cornishware this Valentines? Cornishware originally had blue and white bands and those colours influenced the banner at the top of this blog. Shortly after moving away from Cornwall, whilst visiting back home I was straight down to Trago Mills to get some household goods as now I had to look after myself. So, down in the aisles of Trago with various things in my basket I have probably never used I stumbled on some Cornishware. It was all seconds but suited a young bachelor like myself. So I picked up 2 mugs, my parents gave me sugar, tea and coffee jars that Christmas and my collection has grown ever since. The mug collection grew, a couple have bitten the dust, one of the survivors is sporting a chip and the other a large crack that if you left it for long enough all your tea would probably drain away. So they are now in semi retirement, and are just used when the dishwasher is full of our other mugs. Our old mugs up by the chicken shed from when we had been mucking out - How romantic! 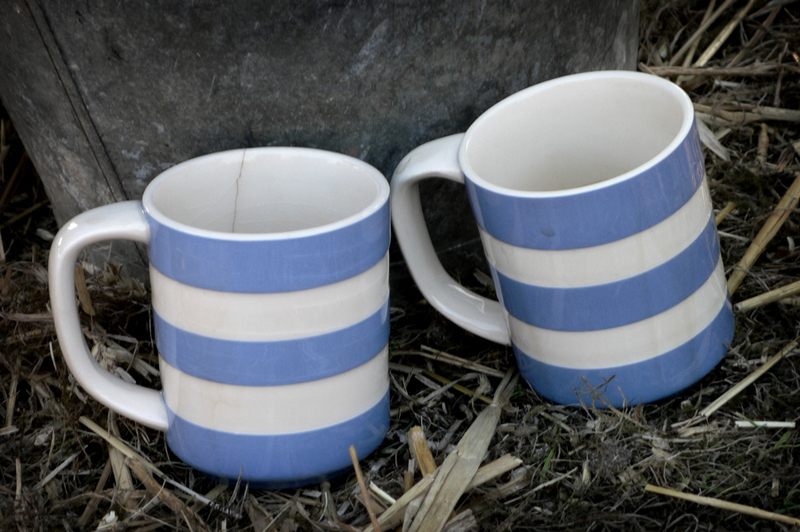 Cornishware is made by T. G Green and the blue and white striped design started production in the 1920 with many households having some Cornishware in their cupboards. Now the old stuff is quite collectible but T.G Green is having a bit of a revival and becoming increasingly popular and trendy! It is said that an employee of T G Green said the blue and white banding reminded them of the blue sky and white crested waves of Cornwall. So treat your loved one (and yourself) to a pair of Cornishware mugs this Valentines – Now available in Red and White! Past Valentines day as you read this? Doesn’t matter Cornishware makes a great gift any day of the year! Click on their link above to take you to the T G Green website. Wondering what to do with the children this weekend and lucky enough to live on the coast? Why not take the children crabbing? 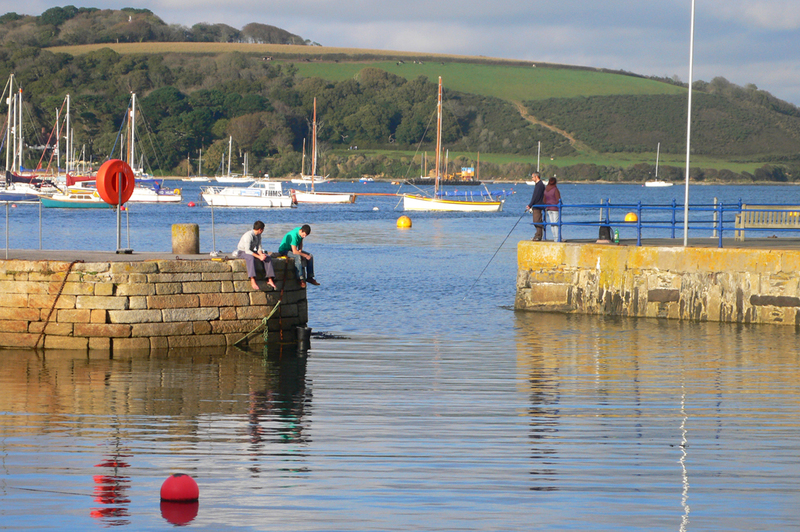 All you will need is a bucket (to put the crabs in), a crabbing line – generally bought from a local seaside shop (or if you are in Falmouth, get yourself down to Trago Mills – on Customs house Quay! ), a net and some bait from a local fishmongers or supermarket (Fish heads /tails generally work well and will be free from a fish monger or bacon is also very good – unfortunately not free from a butcher). 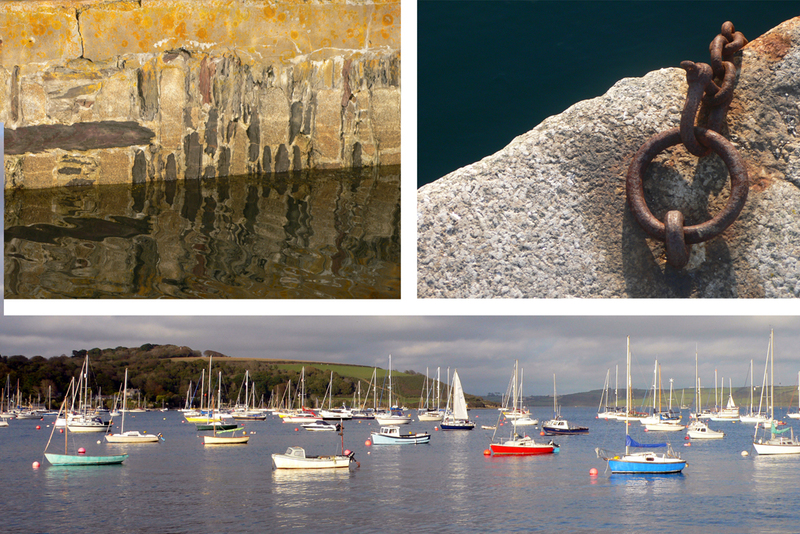 Becky tells me that her Grandad used to use steak to catch crabs – probably some of the luckiest crabs in the sea. So armed with your essentials you should wait for high tide and head to the quayside, hook the bait onto the line and lower the line slowly into the water directly beneath you over the edge of the quay. Wait for a few minutes before raising the line, if you are lucky you will have one or more crabs on your line holding on to their ‘catch’. Collect the crabs in your bucket (make sure its has some sea water in there for the little nippers) and the continue lowering and raising your line periodically. When you have finished crabbing carefully tip the crabs back into the water where they belong ready for someone else to catch them another day! Remember if you are going to handle the crabs hold onto their shells from above with you fingers either side away from their pincers. Happy Crabbing!